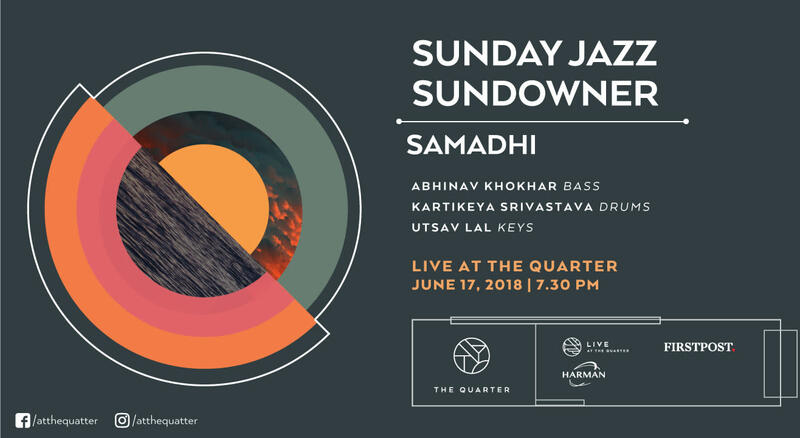 Head over to the The Quarter, for an evening of Jazz and drinks, as Abhinav Khokhar , Kartikeya Shrivastava and Utsav Lal promise you a mesmerizing evening. Samadhi is an experimental trio led by Kartikeya Srivastava. The group features Kartikeya Srivastava on drums, Utsav Lal on Piano and Abhinav Khokhar on Bass. Kartikeya Srivastava is a drummer and composer currently based in New Delhi, India. Kartikeya's deep interest in musical improvisation has led him to places all over the world to study with teachers such as Ian Froman, Casey Scheuerell, George Garzone and Vince Cherico among others. He is concern for broader questions about identity inform and inspire his work. In New Delhi, Kartikeya leads his own trio alongside an upcoming quartet. Utsav Lal has captured the imagination of worldwide audiences and the unique title "Raga Pianist" with his inimitable playing style and innovative handling of a raga. A disciple of Dhrupad maestro Ustad F.Wasifuddin Dagar and mentored by Sharat Srivastava, Lal has also drawn attention for his collaborative work with Irish and Scottish traditional musicians. Lal was recently awarded the TiE- Apire Young Indian Achiever award and the Yamaha Jazz Scholar award. Abhinav Khokhar is an electric/upright bassist and composer with a unique conceptual perspective and sound on the instrument. His approach constitutes of treating music as a language - a dimension on its own that has to be learnt without any boundaries and prejudice. He is a prominent session musician in the Delhi music circuit and hopes to continue his journey by spreading his ideas through music.